Fischer doesn’t actually call these high-end race bindings version 2.0, but we need some way to differentiate them from the previous year’s model since they are completely different. These bindings are made by Dynafit, and folks familiar with the non-autolocking (manual) version of Low Tech Race will know what to expect. A high-tech mixture of magnesium, aluminum, and titanium offer a much-tested connection with your skis. The Tour Race bindings feature both locked-climbing and unlocked-skiing modes. Colored with Fischer green to make them look awesome on AlpAttacks. Proven design that is compatible with the latest ISMF competition rules. Tripod heel pieces have both lateral-heel and forward release mechanisms. Toe has a touring-friendly locking mechanism with a fully-releasable ski mode. One of the lightest all-metal bindings on the market at only 127 grams (4.5 ounces). Backed by Fischer's impressive 4-year warranty on alpine bindings. Looking for a new product photographer. I have quite a few summits on these in the cascades mountains and a trip to Ecuador over three years (20-30 summits). I also take them in the resort once a year to get dialed in for skimo season. This year I hit the terrain park with them for fun and was launching the largest jumps on some movements, aliens and the atk (ficher) bindings. It was quite fun, I did three laps. They are indestructible, light and I ski very well in them considering the ultra light set up. I've never released in them and have taken a few falls coming down into sticky snow off a big climb. I have released skinning when i forget to lock my bindings after a transition or something so I'm confident they would release just fine when needed. I skin with the riser always up (really the only option unless you spin the heel piece which i've never done because it's not needed). I've skinned 40 degree ice sections with ski crampons for short distances with no problems. I can do 30-35 all day doing a nice angled traverse. Usually passing folks doing a much steeper traverse. Go light! 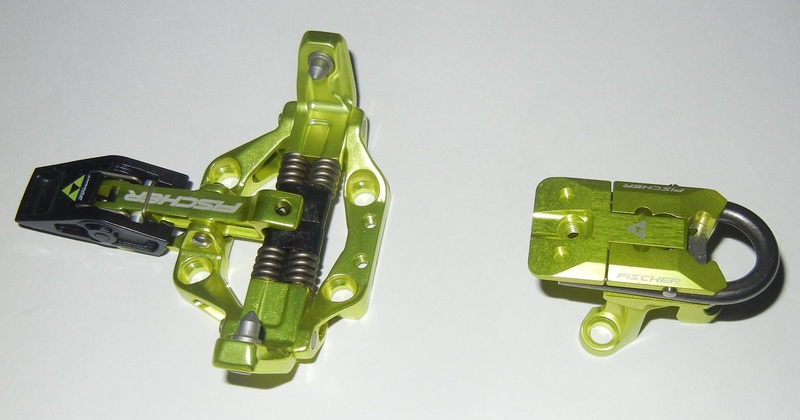 I also believe they have a 0 degree ramp angle which is ideal for me (avoid toe piece plate). I want to be as vertical as possible when skiing. What is the release values for the FISCHER TOUR RACE 2.0 BINDING? I understand it is "fixed" but what type of release value is it fixed at? Thanks. Hi Kelly, the answer is nuanced. If you're looking for a good match for your size, I'd recommend using our binding finder. Wondering if the Dynafit Heel Plate designed for the LTR binding (three hole pattern) will work with the Fischer Tour Race 2.0 heels. Hi Jim, yes it does. Just be careful when selecting, there are a few different version of each (bindings and adjustment plates). Send us a photo of your heel to be sure. Hello, does the heel piece on the Fisher Tour Race "2.0" rotate to offer a flat tour mode option? Hi Johnny, the heel rotates for release but not enough to offer a flat mode. Luckily the only riser is not very high.